Twilight Time could not have chosen a better double feature. I am a huge Jackie Chan fan. I am a huge martial arts fan and Jackie Chan is one of my favorite martial artist. When I read the news that they were releasing this double feature on one Blu-ray I was super excited and giddy like a boy on Christmas morn. You can never go wrong with Jackie Chan movies. His older films are pure delight of entertainment. From hysterical comedy to action packed. His ability to entertain is flawless. Chan stands out above and beyond many martial artists for his ability of doing his own stunts. These two films are the films that showcased his brilliance and his fresh reality of becoming a star. Both released in 1978 and both showcasing his stardom. 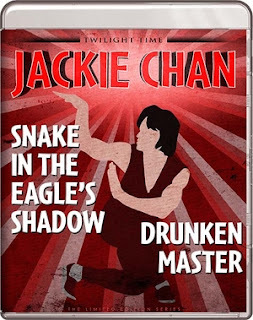 Snake in the Eagle’s Shadow is about an orphan named Chien Fu. He is adopted by a kung-fu school to be there janitor and basically slave work. He is mistreated and used. He finds an old man begging on the street. What Chien does not know is that the beggar is the only surviving martial arts master of Snake Style of Kung Fu. The beggar named Pai is on the run because the Eagle Claw clan is killing off all the Snake-Style clan. A friendship starts and Pai trains Chien in the artform of Snake Style Kung-Fu. Chien is now able to defend himself and help others but also finds himself in the feud between Eagle Claw clan and Snake Style. Besides starring the wonderful Jackie Chan, you also have an equally wonderful Korean Martial Artist Hwang Jang Lee. A true martial artist and actor that graced countless cinema over the years. He not only is a martial artist and actor but he also directed 3 films. Acting in well over 60 performances, his style, his approach and his ultimate acting and martial arts, stands out and is always memorable. Drunken Master is one of my all-time favorite martial arts films. The comedy and goofy nature of the film is something that can’t help but be remembered after watching it. Drunken Master is one of the greatest Kung Fu movies out there. Easily in the top 20 martial arts films. The plot is about the character Wong Fei-hung. Wong is always getting in trouble or over his head in a situation. Now all his troubles lead to him being punished by his father and forced to train more in martial arts. Wong’s father hires Beggar So to train Wong. What this details, is that Beggar So is a trainer that has a reputation in that most of his students end up crippled during the training. Wong decides to run away. Soon Wong finds himself with Beggar So and ends up training in brutal fashion. The training teaches the student the art form of martial artist in a unique way. Wong ends up fleeing again, but runs into a notorious killer. Wong tries to fight the killer but loses. Wong is frustrated and embarrassed and so he makes it his goal to train and follow the harsh training of Beggar So to further his martial arts ability. Both films are directed by the Chinese master director Yuen Woo-Ping. A martial artist choreographer himself, and a standalone of directing brilliance. He is one of the greatest and basically a master at creating Hong Kong Action films. These two films are a prime example of that mastery. What is so great about these two films, Snake in the Eagle’s Shadow and Drunken Master, they are his first films. Snake in the Eagle’s Shadow was his directorial debut. His two films that started his career are both truly one of kind martial arts films that stand out. He aced two films in his career right off the start, and that is what great film making is all about. Now what is so cool about this master, is that he has been the advisor on action and fighting, for some amazing films. He worked his fighting expertise on such greats like 1994’s Fist of Legend. All 3 Matrix movies. Both Kill Bill films. He worked on the masterpiece, 2000’s Crouching Tiger, Hidden Dragon, and many others. Not only a director, and fight choreographer and advisor, but he has also acted in several films. Both movies are a pure delight. Both look amazing on Blu-ray. Twilight Time did a fantastic job in bringing out these two awesome martial arts films. I hope that Twilight Time adventures into other martial arts films in the future. What’s interesting to note is both films star the same people. Jackie Chan, Hwang Jang Lee and Yuen Siu Tien. Now a little trivia Yuen Siu Tien is the real-life father of the director of both films Yuen Woo-ping. Both films have never looked any better. Both films have never sounded any better. Twilight Time did a fantastic job in bringing these two films to 1080p high definition. Both are equally important to the cinema world, specially to the martial arts world of film. In sections of the Cantonese and Mandarin audio tracks where the original dialogue is missing on Drunken Master, an English dub will play. Isolated Music & Effects Tracks: The music for both films was done by musician Fu Liang Chou. Not just a Composer, put a producer. A prolific composer working on well over 220 films from 1967 all the way till 1992. Drunken Master Audio Commentary with Film Historians Ric Meyers and Jeff Yang. A wonderful listen. Always great hearing from film historians. Specifically, Hong Kong Film experts. A lovely listen for any fan of cinema. Great information. Two priceless films. Two priceless films that have never looked any better. This is a high-quality Blu-ray with a master’s touch of showcasing two older martial arts films in a new high-quality transfer, in both audio and video. A priceless example of how to treat older films. I can only hope that Twilight Time adventures once again into some older Martial Arts films, and graces them with the expertise that these two where graced with. This is a highly recommended Blu-ray for any martial arts fan or cinema lover.